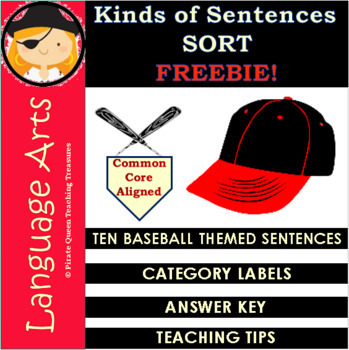 This Sorting Activity is designed to give students practice in identifying the four kinds of sentences: Statement/Declarative, Question/Interrogative, Command/Imperative, Exclamation/Exclamatory. BASEBALL is the topic for the ten sentences. This can be an independent activity or completed in pairs. In addition, you can use it in a literacy center. Thank you for considering this product.